Known locally as 'Pig-Face Day' villagers feast in the village hall after attending evensong at the Church of the Holy Cross at Avening. The feast commemorates Queen Matilda, wife of William the Conquerer, who consecrated the church in 1080. Pig Face Day, which takes place every two years in the Cotswolds village of Avening. In the 12th century, Queen Matilda, wife of William the Conqueror, fell for Brictric, Saxon lord of Avening. When he wouldn’t return her feelings she had him thrown in a dungeon where he died. Overcome with guilt, she commissioned the building of Avening Church, and left money for a parish feast. 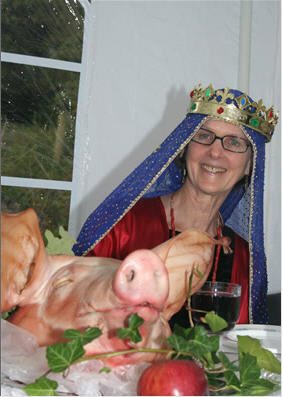 On Pig Face Day, the head of a pig is carried into church on a plate, and a medieval fair takes place. It just wouldn’t happen on Kensington High Street. 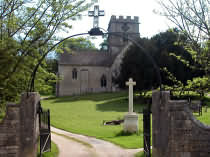 The church at Avening is unique in being the only church commisioned by a queen. Namely Queen Matilda wife of William the conqueror. The story of the founding of the church has all the hallmarks of a romantic tragedy. In the year 1050, Brittric of Avening, Lord of Gloucester was sent by Edward the Confessor as an ambassador to Baldwin, Count of Flanders. It was here that he met Matilda who fell in love with Brittric despite him being married. However Brittric, who was said to be very pale (his nickname was Snow) rejected her advances much to the annoyance of Matilda. shortly after she became queen,she had the King disposses Brittric of the manor of Avening and had him thrown into prison at Worcester, where he died. Rumours have it that the death sounded very much like poisioning. Some years later the queen deeply regretted her actions and built a church at Avening in pennance. The Queen consecrated the church in 1080 and gave a feast of a pigs head to the builders. This feast is still commemorated in the village as Pig Face Day on September the 14th where the villagers "feast" in the village hall. Avening is a large village perched on a steep hillside of the Gloucestershire Avon. Formerly a cloth-making centre, the village became prosperous during the period of the Cotswold wool trade & mills continued to produce cloth late into the twentieth century. There have been settlements in or around the village for thousands of years & several burial chambers are situated within walking distance of the village. The village is 3 miles from Tetbury & 3 miles from Nailsworth. Cotswolds.Info is the World's largest Internet resource for the unique Cotswolds region of England with over 650 webpages of authoriative information so please make use of this facility to help you get the most from your visit to this website.